I love salmon cakes. For Christmas breakfast, I make salmon cakes topped with sliced avocado, a poached egg and a drizzle of Hollandaise sauce. On a weekday night, I throw together salmon cakes drizzled with parsley sauce served alongside crispy potatoes and steamed veg. There’s no wrong time. Now, as much as I love salmon cakes, I can’t help but to feel a little shameful when I take a beautiful salmon fillet and chop it up to make fish cakes. After all, there’s so much that one can do with a beautiful piece of salmon. To help satiate my craving for fish cakes and to alleviate my shame about waste, I decided to try my hand at making them with that poshest of humble things: salmon trimmings. If you like to eat as sustainably as possible and hate food waste, then I highly recommend making fish cakes of any kind with leftover trimmings. If you’ve got a gentle hand and are vigilant with fish bones, then you are rewarded with moist salmon, soaked in that good omega-3 fat. If not, no problem. Just used canned salmon or fry up some fillets. This fish cake recipe is good both ways so the choice is yours. Moist and tasty salmon cakes made from leftover trimming. 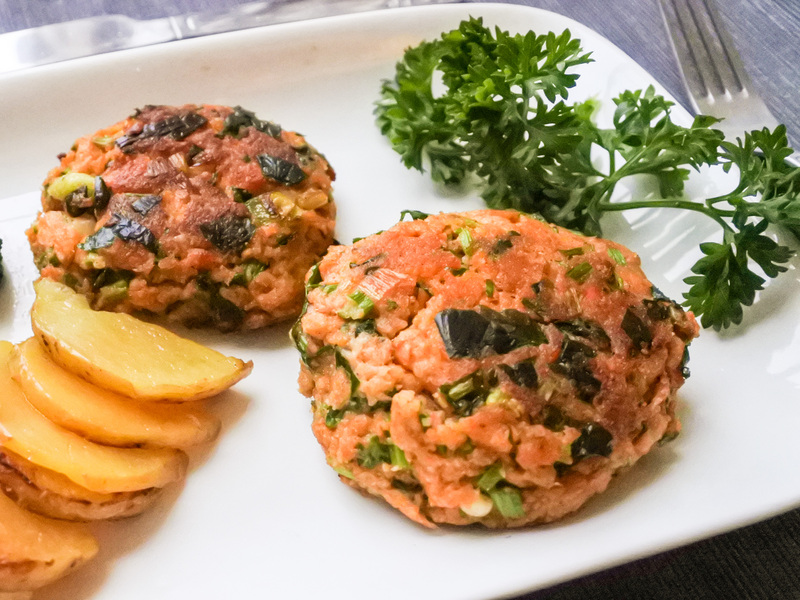 A great recipe for those that love salmon cakes but hate food waste. Put salmon trimmings into a casserole dish and sprinkle with salt and pepper. Roast in the oven for 30 minutes or until fish is cooked. When fish is cooked, remove from oven and let cool. When cool enough to handle, carefully remove the meat from the bones. Be watchful for the stray fish bone. Discard skin and bones. Keep any oil for frying later. Combine salmon meat with chopped scallions, garlic powder, paprika, chopped celery leaves, breadcrumbs, egg, lemon zest, ginger powder, a pinch of nutmeg, Dijon, salt and a sprinkling of black pepper. Mix until thoroughly combined and refrigerate until ready to fry. When ready to fry, add a drizzle of oil to a frying pan on medium/medium high heat. Using your hands, form mixture into patties and place in the hot frying pan. Cook until golden brown on both sides (should be 5-7 minutes on each side). Try not to flip the salmon patties more than once as they can easily fall apart. When golden brown on both sides, remove from heat and serve with your favorite sauce. Combine cooked salmon with chopped scallions, garlic powder, paprika, chopped celery leaves, breadcrumbs, egg, lemon zest, ginger powder, a pinch of nutmeg, Dijon, salt and a sprinkling of black pepper. Mix until thoroughly combined and refrigerate until ready to fry. Preheat oven to 200C/400F. Put salmon trimmings into a casserole dish and sprinkle with salt and pepper. Roast in the oven for 30 minutes or until fish is cooked. When fish is cooked, remove from oven and let cool. Combine salmon meat with chopped scallions, garlic powder, paprika, chopped celery leaves, breadcrumbs, egg, lemon zest, ginger powder, a pinch of nutmeg, Dijon, salt and a sprinkling of black pepper. Mix until thoroughly combined and refrigerate until ready to fry. When ready to fry, add a drizzle of oil to a frying pan on medium/medium high heat. Using your hands, form mixture into patties and place in the hot frying pan. Cook until golden brown on both sides (should be 5-7 minutes on each side). Try not to flip the salmon patties more than once as they can easily fall apart. When golden brown on both sides, remove from heat and serve with your favorite sauce.